I was perusing the North York Moors Rights of Way map the other day when I noticed that there is a Public Bridleway that zigzags its way from the top of Roseberry Lane almost to the summit. In the photo, the bridleway comes up the flagged path to the bend and then continues to the ridge before descending to the Common. I am actually standing on the Right of Way which has just a faint trace of recent use. Instead of my usual zoomable map, I’ve included a screenshot of the aerial photograph today with the Rights of Way overlaid. Public Footpaths are in purple, Public Bridleways are in green. The photo is taken from point A looking south-west. This begs the question, why? 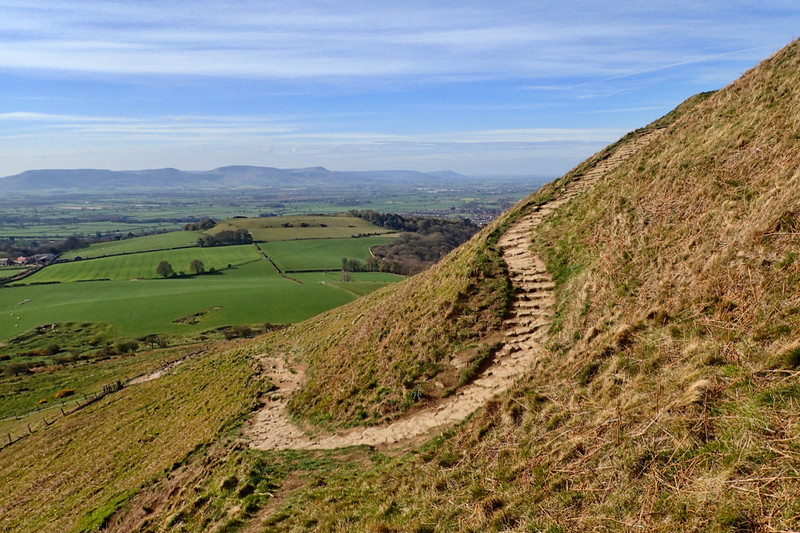 When the Rights of Way were being defined pursuant to the National Parks and Access to the Countryside Act 1949 why did the surveyors mark a route almost but not quite to the summit of Roseberry? It is not improbable that some enterprising farmer in Newton took tourists up Roseberry on ponies, tethering them near the summit permitting them a short final climb. But I have read no account of this and to me, a firm non-rider, it would be pretty scary on the steep slopes both up and down. Sandstone from the Topping was quarried and would have been brought down on sledges perhaps controlled by horses. The sledges would certainly need to have been dragged up using horses. There is a small quarry a little up the path to the right which it is speculated may have been where the stone for Roseberry Ironstone Mine came from. Or perhaps stone for the summerhouse came from here. Some other oddities can be seen which have also been lost to history. The directissimo Public Footpath ascent of Roseberry gains Cockle Scar at a point 30m or so to the north-east of the notorious chute used in the Roseberry Race (Point B). This is now completely overgrown with a fence at the bottom but I remember using it when I first did the race in the late 1970s before the steps were built and the chute became the fastest route. Point C is at the col on Roseberry Common. The present path to Guisborough, nicknamed the yellow brick road, can be seen heading off a little west of north. But the Public Bridleway actually goes NNE. Again a faint path exists. Finally, I see there was never actually a Right of Way along the crest of Roseberry (although now there is the Cleveland Way, a National Trail).